I had some white eggs remaining from the confectioner’s cream I did before so I decided to do French Meringues as my boyfriend likes them. 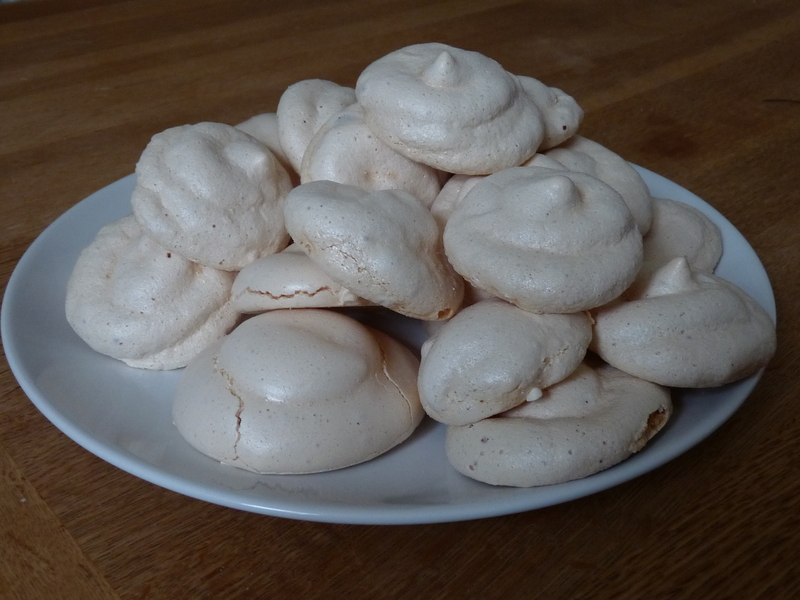 I think they are the easiest meringues to bake. Preheat the oven to 110° C and prepare a baking sheet. In a bowl, whip egg whites until foamy using an electric mixer. Sprinkle in sugar a little at a time, while continuing to whip at medium speed. When the mixture becomes stiff and shiny like satin, stop mixing, and transfer the mixture to a large pastry bag. Pipe the meringue out onto the prepared baking sheet. Place the meringues in the oven. Bake for 40 minutes for the small meringues or 1h30 for the big ones. Allow the meringues to cool completely before storing in an airtight container at room temperature. This entry was posted in Recipes and tagged French Meringues by thebloodyfrog. Bookmark the permalink.